The worst thing that can happen to a great movie is, in hindsight, for its release to have been in 1939, 1943, 1961, 1962, 1972, 1974, 1975, 1991 or 1997. Let’s talk about The Godfather, widely acclaimed as a top film of all time. The casting – almost perfect; the writing – too accurate; the adaptation – who remembers the book? The Godfather, the movie, benefits from almost every detail: the early 1970s determined the rise of the mafia movie and The Godfather was (is) the strongest, all(!) the actors had already developed impressive résumés (no need to develop unknowns), the important scenes resonate with us (still) and we can never look at equus the same way. The parts all add to an absurd sum. The Godfather transcends genre, convention and, really the plasticity of awards shows. Of course, in infinite, alternate universes other movies could have won Best Picture. In those same universes, though, no one would have thought to have made any movies ever. 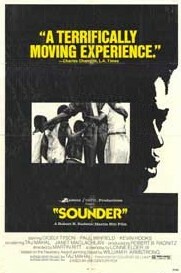 That being said, it’s a damn shame that Sounder was released in 1972. Released during the Second Golden Age of Filmmaking, Sounder tells the story of a poor, black family growing up and together in the poorest of times to be a poor, black family – 30s Depression. Its brilliance, and what allows us to examine Sounder from a different angle is that Sounder is not exploitative. It doesn’t aim to make an example of blackness or poverty, save to tell the story. And the story itself is largely inconsequential – the details matter inasmuch as to develop the theme. Sounder, it turns out, is not an obfuscated Faulkner reference, but a pup, and one who provides much-needed comfort and support to the family. He is the only constant in a world of changing variables: sometimes there’s no food, sometimes there’s no family, sometimes there’s unthinkable cruelty (as was the case in 1930s Louisiana); but there’s always Sounder. When Sounder is feared lost or dead, the family knows that he’s not. Sounder is faith and spirituality embodied and emboldened. It’s inspiring work. It’s just too damn bad that Sounder saw a release in 1972. Not only did it lose all the categories for which it earned nominations, not a single person that I’ve talked to had even heard of it. We know Cabaret from its Broadway leanings and we know Deliverance because creepy, but Sounder is too wholesome and its themes too unchallenging, despite the heartwarming messages and the understated acting. Its timing is peculiar, too, besides the 1972 unfortunateness. Coming off licking its wounds of the torrid 1960s, the civil rights movement may just have been too fresh in people’s minds and perhaps awarding a Best Picture Oscar to a movie about terribleness of white folk antebellum is too soon. Sounder worked as a children’s book – but as a movie? We had to wait over 40 years for a movie about slavery (or indentured servitude – for all intents and purposes, the same thing) and minority struggle to win. And we can still make the argument that the nod is more of a reparation replacement or a bandage over the still fresh wound that is race inequality. In fact, there may never be a right year to have seen Sounder‘s release. While we talk about exploitation purely in the black context (“blacksploitation”), we remember that Sounder did its damnedest to keep constant the themes of hope, drive and alternative success without this concept, and that The Godfather has made a reputation and crafted legend off the exploitative drama of Italians and Italian-American emigrants. Are we so caught up in the straightforward greatness of The Godfather to discuss that its whole premise relies on our blown-out belief of mafioso stereotypes and that the violence is necessary and tied to this particular genre and culture. Why don’t we talk about great films in this context? Our blinders are unfortunately static, too. But the biggest winners have also set up the biggest losers: the 53 films nominated and forgotten during the tenure of the greats. Let’s make it a goal to watch, honor and respect those films, most of which are deserving of a nod in another universe, in another year and in another context. Of The Godfather‘s opponents, none hold a candle to the collective filmmaking triumph that is Francis Ford Coppola’s place in history: Deliverance and Cabaret are mostly fluff….and The Emigrants is Swedish (and foreign – the Academy had a history of ignoring anything not distinctly ‘American’) so ponder The Godfather‘s massive shelf appeal: maybe its win is slightly dimmed by 1972’s diminutive competition. And if the alternative is best exemplified in 1976 and 1994, when we can pick at least three winners and thus every film loses, let’s not dub Sounder The Godfather‘s foot pedestal, but rather its unfortunate competition within the Best Picture film sphere.